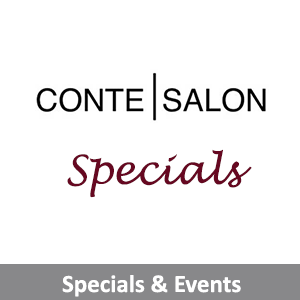 Conte Salon, located in Boynton Beach, FL in the Canyon Town Center, is an upscale salon offering everything from soothing scalp massages, precision haircuts, custom color, hair straightening, hair extensions, nail services, waxing, skin care and makeup, we offer head to toe beauty. Call us to set up a complimentary consultation. About our Location – we are located in the Canyon Town Center, Boynton Beach’s Premier Destination. At the corner of Boynton Beach Boulevard and Lyons Road, there is lots of shopping, restaurants and open space to gather with friends. Canyon Town Center is home to Publix, Walgreens, Bank of America, Panera Bread, US Postal Service, Restaurants and Shops. Plus an interactive fountain for the kids and an Amphitheater for events. Parking is free and so is the fun!